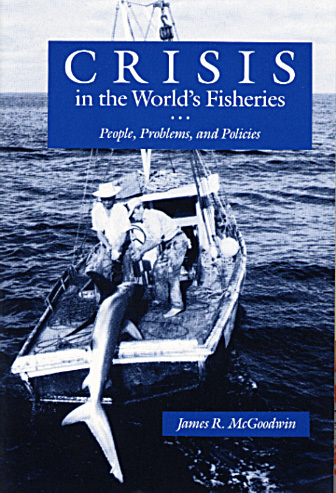 Full Title: Crisis in the world's fisheries : people, problems, and policies. Publisher: Stanford, Calif. : Stanford University Press 1990. Includes bibliographical references (p. 205-231) and index. Subjects: FISHERY MANAGEMENT. FISHERY POLICY. "In this book I want to present a fresh reconsideration of fisheries management, one emphasizing fishers and fishing peoples, which I hope will be accessible to all students of the fisheries—apprentices, able hands, and old salts alike. Beyond that, I hope to afford some interesting reading for anyone merely interested in fishers and the sea." For nearly twenty years, all around the world, from the coldest arctic regions to the warmest tropical seas, an alarming trend has emerged in the world's fisheries: quite simply, there are too many fishers chasing too few fish. This book provides a broad overview and fundamental reassessment of fisheries management policies around the world. The perspective is international and draws on a wide range of literature (including anthropology, ethnographies, law, policy studies, and history). The author believes that new approaches in fisheries management, such as an increased focus on small-scale rather than large-scale, industrialized fishers, will lead to more effective policies, greater protection of the resource, and increased productivity in the future. "McGoodwin critically examines accepted fisheries management practices and advocates alternative approaches that would situate the social and economic needs of fishers at the forefront of policy considerations. Yet, the book is much more than that. As the title indicates, McGoodwin's book is sweeping in its coverage. It addresses virtually every aspect of fisheries-cultural, economic, political, and environmental. . . . It is a good introductory book for persons, no matter their discipline or profession, who are interested in natural resource management in general, and fisheries in particular. . . . On the other hand, McGoodwin has provided a valuable service for all by pulling together in one place an extensive and timely review of the fisheries literature." "It is difficult to disagree with McGoodwin's overall argument: contemporary fisheries management must change. His book provides a broad review of fisheries management policies and an important prescription for an ailing industry and way of life. It is written in a style that commends itself to fishers, fisheries managers, and academics alike. It is an important book whose audience is sure to extend far beyond the bounds of maritime anthropologists."